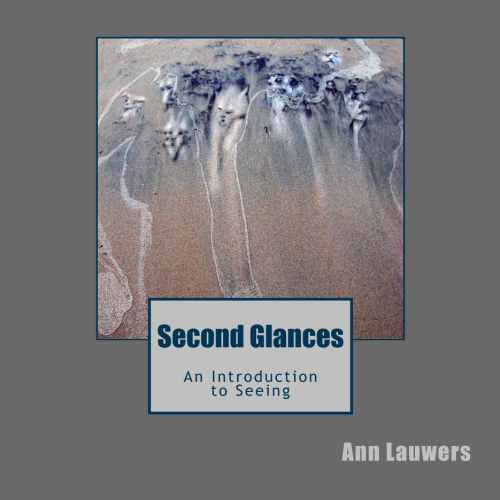 Second Glances | Ordinary images of ordinary things, that is, until you take that second glance. Really? That’s what they’re called? Find out the inside story when you sign up for the free monthly newsletter. S ometimes, there is more to see then you first realize. Is it really just a simple cliff? 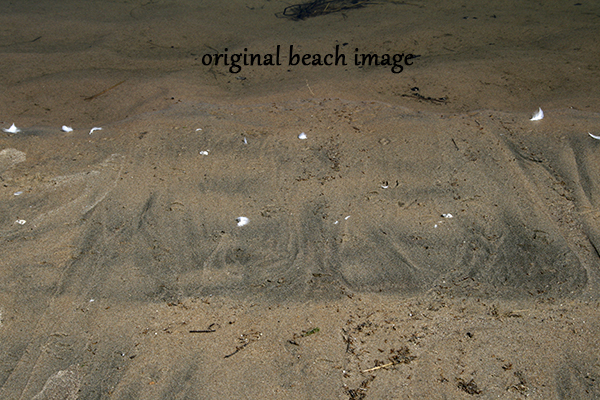 This is just one image being created for the Second Glances book series available on An Artist’s View Photography. 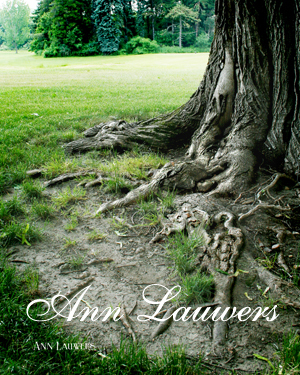 I sent out the first An Artist’s View’s email newsletter this morning. Did you get yours? Being a subscriber means you’ll be the FIRST to see new images, even before they are released to the public. You’ll be given first opportunity at limited editions, and be able to purchase these images at a special discounted rate. And….did I mention……IT IS FREE! You’ll also hear the Behind the Scenes Stories about the creative process and get some free things along the way that will not be offered to non-subscibers. The new fall image and some photoshop secrets on it’s creation. You’ll hear about what’s going on behind the scenes of both my books, Second Glances and Adventures Through the Enchanted Door. A special on Note Cards just in time for the holidays. 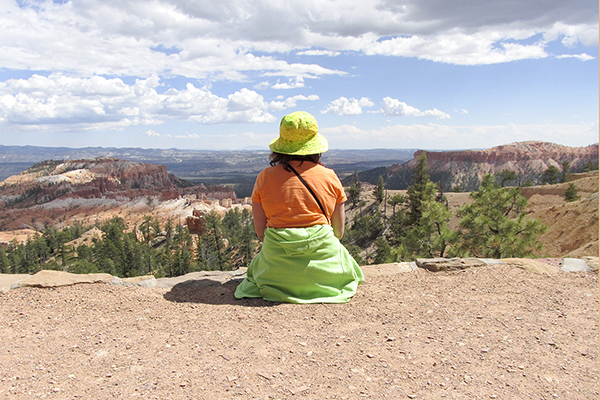 Then, On a Personal Note, I share a few things on my most recent trip out west. Don’t be left out! Sign up today. The Subscription link (by Benchmark) is on the side panel on this page. Or you may sign up from my website. As you know I’ve been traveling the west coast for the past three weeks in search of some rest, relaxation, family time and some new materials. Sometimes you just need to get out of your environment to give yourself a new perspective on life. I most certainly got that. I live here in Michigan and although we have some beautiful lakes and shoreline, nothing here will ever make you feel like you are just a tiny speck on this earth like some parts of the west coast. Our first stop was Bryce Canyon where we felt like we could reach out and touch the stars while sitting on the edge of the canyon late at night. The Grand Canyon looked like it just wasn’t even real. Being so large I felt like you couldn’t touch it or connect with it because of it’s size. Yosemite was so tall around you and so where the Sequoias and the Red Woods. My perspective will never be the same. I took hundreds of photos and although I loved the trip and landscape out there, I am very glad to be back home and back to my artwork. The images I took of the trees and the rock formations will keep me busy for the long winter ahead. This top image is one of the images I’ll be working on and using in my upcoming book Whispers of the Woods, due out next summer. This guy was so obvious I couldn’t help but stop and take his picture and smile. The bottom image is just to show you how big these trees really are. As you can see the size with Jerry climbing into this tree. It’s time to go play now. Time to set work and responsibilities aside for awhile and just be a kid again. For the next few weeks I’ll be taking off my reading glasses and abandoning my computer in exchange for traveling to new places, hiking into new territory, and most of all reuniting with my old friend, my camera. I can’t wait to see what is waiting out there for me to see. Something tells me it’s going to be big. Until I return, ….Remember…..it’s not what you look at that matters, it’s what you see. I’ll leave you with Hungry Bear. I found him on a very fast river in Yellowstone National Park a few years back. 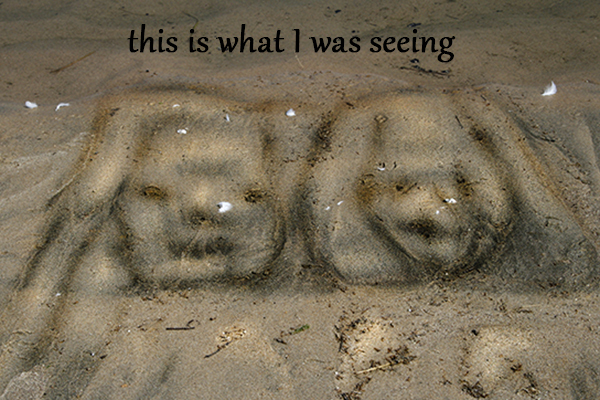 The next time you take a stroll on the beach, you might want to keep an eye out for what you may be watching you. I found these guys while walking on the beach at Tawas Point a few weeks ago and they weren’t the only ones. Be sure to keep an eye out. I’ll be off on vaca for the next month exploring the national parks and the beaches of california. Can’t wait to see what I find. Oh, come on now, quit shaking your head and rolling those eyes for just a second and let me explain. This really is a good idea! Really! I want to start a newsletter. That’s right, just a small email newsletter that I could send out maybe just once a month giving you an insiders look at what is going on at An Artist View Photography. But here’s where I need your help. I really need your help picking out some topics. That way I’ll be sure to address some of the things you want to read about. After all, I could only hope that it would become something you would look forward to receiving and enjoy reading. Would you like topics on photography, photoshop, demonstrations on how I go about creating an image? How about using background textures with your photographs? Then, there are those wonderful little fairies and the process of digitally creating them. And don’t forget about Second Glances, I love find them! Please help by leaving a message below as to what topics you like most and I’ll be sure to try and fit them all in. And don’t forget to sign up for the newsletter. I’ve placed a link on every page this is posted on. I’ve even updated the website to include it right on the homepage. They’re calling! Can you hear them? I got a chance to spend some time at Hartwick Pines State Park, here in Michigan, USA last weekend. They have some of the oldest pine trees in the state. What a peaceful feeling to walk amongst these very tall pines. Their canopy so thick the little sprouts don’t stand a chance of growing without our intervention. In a few months I’ll be visiting some of our nations National Parks with Redwood Forest being the final destination. They will make our old pines look like undergrowth. I’ll keep you posted on what I find along the way. It’s been a while since I’ve grabbed my camera and listened to the calling of nature. It always came on by surprise. A little nudge you might say. I would carry may camera with me just in case, blocking out the busy life in search of the unexpected I so loved. It’s been at the back of my mind lately so today I’ll brush off my camera, make sure the batteries are charged and then wait to see what will appear. 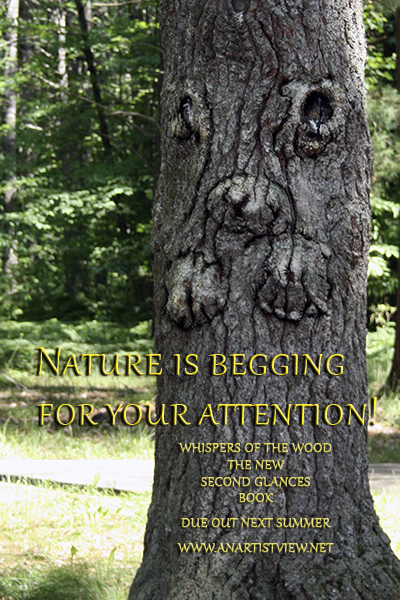 There is a tree I see on my walks I take with the dogs that has been begging for attention. I’ll be sure to post it soon. Until then, see what you can find in this one that was taken at Meadowbrook Hall in Rochester, MI. Remember, keep love in your heart, open your minds and the magic will appear. Just in case you were wondering where I’ve been these past few months, let me explain my absence. As an artist, you really don’t know where your creative mind will lead you next. Well lately, mine has had me on an adventure in my very own back yard. You see….there are a lot of magical things out there. Just ask my grand kids as to why they carry skiddles in their pockets while walking threw the gardens. Searching under rocks, listening for strange sounds and setting fairy traps at night in hopes of finding a new friend in the morning light. I’ve set the camera down for a little while in order to see the world from their eyes. Most of us leave our imaginations behind as we grow up but kids have no rules and no limits on theirs. It’s not until we have grand kids of our own when we revisit those childhood wonders again and get away with it without the fear of others thinking we have totally lost it. Trust me…I’m seeing this reaction from family and friends already. But don’t worry about me, I’m having my second childhood and loving it! You’ll see soon enough. 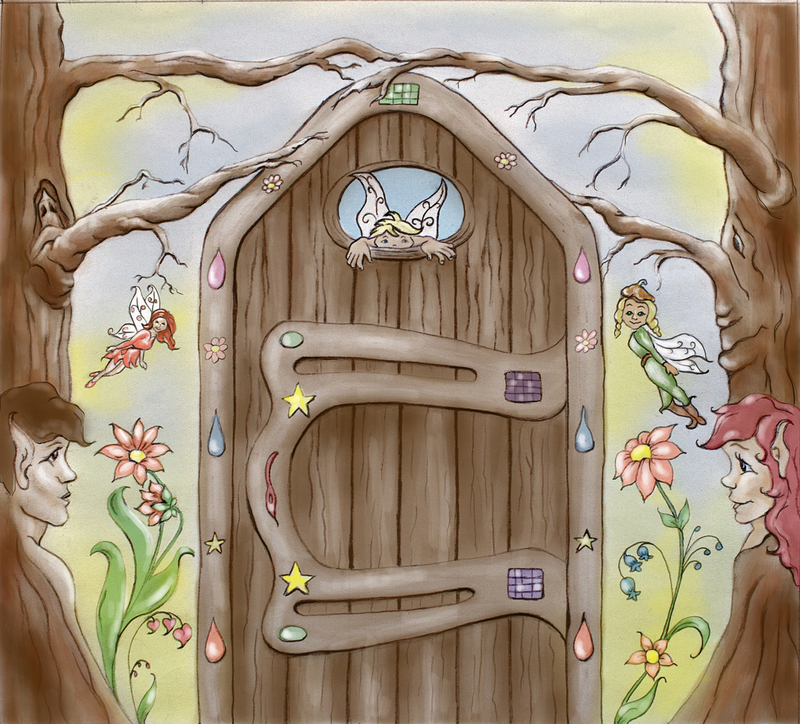 Is a story about children, fairies, a magical yard and a couple of Woofenwiggles .